Transporting material to a site can be a costly process, so ensuring civil construction companies are able to keep track of how much they are purchasing can help the bottom line. When using rough estimates or imperfect calculations based on weight, there is a chance factors like water or material already within the bin can throw off the numbers. On top of this, manual systems or customer disputes can slow down productivity when it’s most needed. Loadscan are the original developers of Load Volume Scanners (LVS) – a product that uses laser measurements and custom software to determine the exact volume of material being loaded into a truck, with readings accurate to within plus or minus one percent. Carey West, Managing Director of Loadscan, says it saves civil construction companies money by providing accurate, low maintenance and non-contact drive through measurements. Each truck entering a site can be scanned by the LVS, to create a profile of the empty truck bin and 3D map of the truck’s actual volume. Each truck can then be assigned a radio frequency identification (RFID) tag to automatically identify it. When the truck makes its return trip under the scanner, the LVS autonomously measures the volume of material loaded in the bin and compares it to the profile of the empty truck. It processes the vehicle while it’s moving, at speeds of up to six kilometres an hour in about five to ten seconds. Mr. West says it solves the issues that arise when converting weight to volume which, over time, compound into hundreds of thousands of dollars in costs. 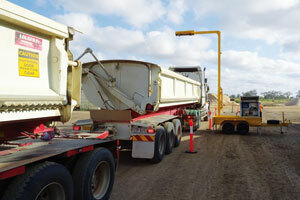 “When you buy gravel material, it is typically sold by weight so trucks can be legally loaded for the highway. Yet, in construction, the quantities are typically scheduled in cubic volume. For example, if a rectangle hole is excavated to be six metres-long, four metres-wide and one metre-deep, a company would need 24 cubic metres of gravel to fill the hole,” Mr. West explains. Mr. West says gone are the days of collecting truck dockets and spending hours sorting through paper records at the end of the month. With the Loadscan LVS, companies are able to keep track of exactly what material is being moved where. “Companies are able to better understand the exact quantity of material being hauled in or out of a construction site and can manage multiple contractors using the RFID tag system,” he says. Mr. West says that with real-time load data, Loadscan’s technology removes phantom loads which are charged for but aren’t delivered. “The LVS system stores a data file of every load, which is encrypted on the LVS computer and then sent to the site’s head office for real-time reporting,” he says. “These optimised payloads give operators feedback to improve their loading abilities and lets them aim for more efficient use. For comparison, if a remote quarry is using loader scales for the point of sales management, drivers will need to get a ticket from the loader operator. Mr. West’s father, Wayne West, began developing the technology in 1998 for their construction company West Construction. After 18 months of research and development, the technology went to market. “The system was born out of our own construction company, so we had test sites available to make sure the system could handle the harsh environments and industries it would be used in,” Mr. West says. 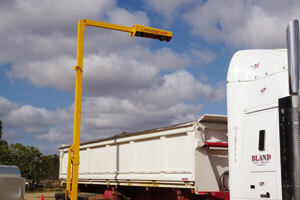 “Relying on old measurement methodologies like bucket counting, eyeballing truck measurements or only using weigh scales is like putting your head in the sand. Real-time load data information is the key to profitability and success in businesses of the future,” he says. In the first year of business, Mr. West says he sold eight LVS units. Now he says they’re selling more than 30 in a year and expect that number to rise to 60 in 2020. Mr. West says the company is constantly innovating and improving. He says Loadscan will be releasing a new volumetric measurement product, called the Conveyor Volume Scanner, for measuring material moving on a conveyor belt, which is expected to hit the market in August this year.